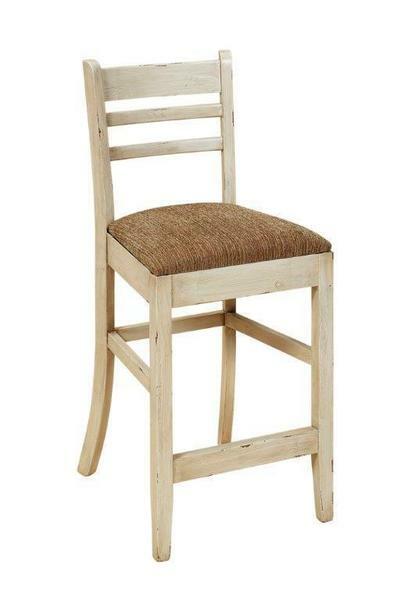 Fall in love with the comfort and style of the Amish Brady Bar Stool at your kitchen counter. Contemporary shapes are displayed with high, horizontal slatwork defining the stool back. A wide lower stretcher supports your feet as you sit, while the back bar stool legs curve gracefully back. These elegant details represent traditional style, and when it's combined with contemporary elements you receive a stunning transitional look for your kitchen furniture collection. The gentle curves of the Amish Brady Bar Stool create an inviting atmosphere in your kitchen. Save yourself from setting the dinner table with a comfortable meal at your kitchen island or counter. Create the cozy game room you've envisioned with a set of solid wood bar stools. Be sure to take a look at our blog post, Beyond the Bar: Other Uses for Bar Stools for more ideas using bar stool seating throughout your home. Seat Height from Back: 13.5"